All my life I have felt a need to work with my hands. As a small child I was a big fan of plasticine but when old enough to be allowed a penknife discovered the joys of carving using balsa wood and driftwood collected on the beach. 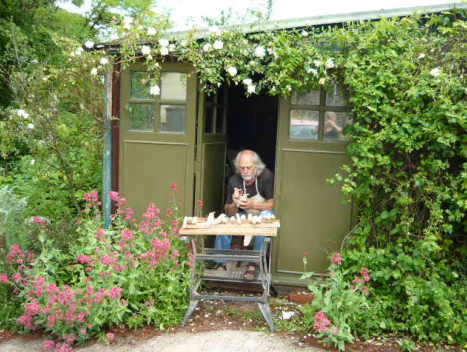 I trained as a teacher but specialised in Painting and Sculpture, selling works in paint, metal and clay while still at college. I had no formal training but attended Teacher Training College where I took Art as my main subject and specialized in Painting, Sculpture and Fabric printing. Since then my income has been a balance between art, craft and teaching. In the 1970s and 80s I worked as a sign writer, mural painter and furniture decorator. I had a number of exhibitions in Cambridge of watercolour paintings, produced illustrations for the BBC's Jackanory programme and also illustrated 'Indian Folk Tales' by Rani Singh published by William Heinemann. My work was also selected in the International Artists in Watercolour Competition in 1982 and subsequently displayed in the Mall Galleries in London. During the late 80s, bolstered by a lifelong interest in craft and other cultures, I began to produce black and white illustrations for books on Textiles, Craft and Architecture for Thames and Hudson. I have since worked on eleven books and written five of my own on world craft genres and techniques. The latest, 'Craft Traditions of the World', was authored by my wife, Polly. Since moving to Devon in 2003 I have made and sold pottery in the North Devon sgrafitto style and painted in acrylics choosing subjects inspired by an idealized view of the local landscape, both rural and coastal. I have exhibited at the Plough Arts Centre in Great Torrington several times, at the Burton Museum and Art Gallery in Bideford, at local agricultural shows and at the Seventh Wave Gallery in Bude and the Chase Art Gallery in Wadebridge. I have had many influences on my work over the years including Persian and Japanese art, the illustrator Edmund Dulac, the Cornish artists colonies of the 19th century, Caspar David Friedrich and the English visionary painter Samuel Palmer. To convey the mood and essence of my subject matter, the style of my work has in the last few years become simple and colourful and could probably loosely be described as folk art rather than 'academic' fine art painting, my choices being based on the emotions and the soul rather than intellectual considerations.